The clock control system can source the system clocks from a range of internal or external high and low frequency oscillators and distribute them to modules based upon a module’s individual requirements. Clock distribution is automated and grouped independently by module to limit current consumption in unused branches of the clock tree. The HFCLK controller provides several clock signals in the system. For illustration, see Clock control. The HFCLK controller will automatically provide the clock(s) requested by the system. If the system does not request any clocks from the HFCLK controller, the controller will enter a power saving mode. The HFINT source will be used when HFCLK is requested and HFXO has not been started. HFXO power-up time, as specified in 64 MHz crystal oscillator (HFXO). HFXO debounce time, as specified in register HFXODEBOUNCE. The HFXO must be running to use the RADIO or the calibration mechanism associated with the 32.768 kHz RC oscillator. The 64 MHz crystal oscillator (HFXO) is controlled by a 32 MHz external crystal. The crystal oscillator is designed for use with an AT-cut quartz crystal in parallel resonant mode. To achieve correct oscillation frequency, the load capacitance must match the specification in the crystal data sheet. Circuit diagram of the 64 MHz crystal oscillator shows how the 32 MHz crystal is connected to the 64 MHz crystal oscillator. C1 and C2 are ceramic SMD capacitors connected between each crystal terminal and ground. For more information, see Reference circuitry. Cpcb1 and Cpcb2 are stray capacitances on the PCB. Cpin is the pin input capacitance on the XC1 and XC2 pins. See table 64 MHz crystal oscillator (HFXO). The load capacitors C1 and C2 should have the same value. For reliable operation, the crystal load capacitance, shunt capacitance, equivalent series resistance, and drive level must comply with the specifications in table 64 MHz crystal oscillator (HFXO). It is recommended to use a crystal with lower than maximum load capacitance and/or shunt capacitance. A low load capacitance will reduce both start up time and current consumption. The system supports several low frequency clock sources. The LFCLK controller and all of the LFCLK clock sources are always switched off when in System OFF mode. The LFCLK clock is started by first selecting the preferred clock source in register LFCLKSRC and then triggering the LFCLKSTART task. If the LFXO is selected as the clock source, the LFCLK will initially start running from the 32.768 kHz LFRC while the LFXO is starting up and automatically switch to using the LFXO once this oscillator is running. The LFCLKSTARTED event will be generated when the LFXO has been started. The LFCLK clock is stopped by triggering the LFCLKSTOP task. It is not allowed to write to register LFCLKSRC when the LFCLK is running. A LFCLKSTOP task will stop the LFCLK oscillator. However, the LFCLKSTOP task can only be triggered after the STATE field in register LFCLKSTAT indicates LFCLK running state. The synthesized 32.768 kHz clock depends on the HFCLK to run. If high accuracy is required for the LFCLK running off the synthesized 32.768 kHz clock, the HFCLK must running from the HFXO source. The default source of the low frequency clock (LFCLK) is the 32.768 kHz RC oscillator (LFRC). The LFRC oscillator has two modes of operation, normal and ultra-low power (ULP) mode, enabling the user to trade power consumption against accuracy of the clock. The LFRC mode is configured in register LFRCMODE. The LFRC oscillator has to be stopped before changing the mode of the oscillator. The LFRC frequency will be affected by variation in temperature. The LFRC oscillator can be calibrated to improve accuracy by using the HFXO as a reference oscillator during calibration. The LFRC oscillator does not require additional external components. After the LFRC oscillator is started and running, it can be calibrated by triggering the CAL task. The LFRC oscillator will then temporarily request the HFCLK to be used as a reference for the calibration. A DONE event will be generated when calibration has finished. The HFCLK crystal oscillator has to be started (by triggering the HFCLKSTART task) in order for the calibration mechanism to work. It is not allowed to stop the LFRC or write to LFRCMODE during an ongoing calibration. The calibration timer can be used to time the calibration interval of the 32.768 kHz RC oscillator. The calibration timer is started by triggering the CTSTART task and stopped by triggering the CTSTOP task. The calibration timer will always start counting down from the value specified in CTIV ( Retained ) and generate a CTTO event when it reaches 0. The calibration timer will automatically stop when it reaches 0. After a CTSTART task has been triggered, the calibration timer will ignore further tasks until it has returned the CTSTARTED event. Likewise, after a CTSTOP task has been triggered, the calibration timer will ignore further tasks until it has returned a CTSTOPPED event. Triggering CTSTART while the calibration timer is running will immediately return a CTSTARTED event. Triggering CTSTOP when the calibration timer is stopped will immediately return a CTSTOPPED event. For higher LFCLK accuracy (when better than +/- 500 ppm accuracy is required), the low frequency crystal oscillator (LFXO) must be used. Low swing clock signal applied to the XL1 pin. The XL2 pin shall then be grounded. Rail-to-rail clock signal applied to the XL1 pin. The XL2 pin shall then be grounded or left unconnected. To achieve correct oscillation frequency, the load capacitance must match the specification in the crystal data sheet. Circuit diagram of the 32.768 kHz crystal oscillator shows the LFXO circuitry. C1 and C2 are ceramic SMD capacitors connected between each crystal terminal and ground. Cpcb1 and Cpcb2 are stray capacitances on the PCB. 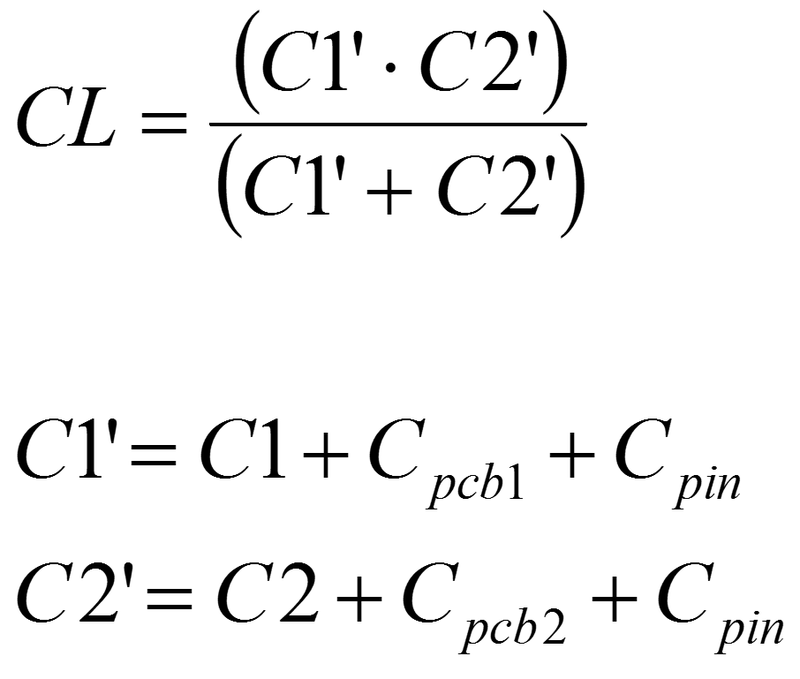 Cpin is the pin input capacitance on the XC1 and XC2 pins (see Low frequency crystal oscillator (LFXO)). The load capacitors C1 and C2 should have the same value. For more information, see Reference circuitry. LFCLK can also be synthesized from the HFCLK clock source. The accuracy of LFCLK will then be the accuracy of the HFCLK. Using the LFSYNT clock avoids the requirement for a 32.768 kHz crystal, but increases average power consumption as the HFCLK will need to be requested in the system. HFXO debounce time. The HFXO is started by triggering the TASKS_HFCLKSTART task. The EVENTS_HFCLKSTARTED event is generated after the HFXO power up time + the HFXO debounce time has elapsed. It is not allowed to change the value of this register while the HFXO is starting. HFXO debounce time. Debounce time = HFXODEBOUNCE * 16 us. 256 us debounce time. Recommended for TSX-3225, FA-20H and FA-128 crystals. 1024 us debounce time. Recommended for NX1612AA and NX1210AB crystals. Calibration timer interval in multiple of 0.25 seconds. Range: 0.25 seconds to 31.75 seconds. Pin multiplexing of trace signals. See pin assignment chapter for more details. No trace signals routed to pins. All pins can be used as regular GPIOs. SWO trace signal routed to pin. Remaining pins can be used as regular GPIOs. All trace signals (TRACECLK and TRACEDATA[n]) routed to pins. Active LFRC mode. This field is read only.